If you wish to travel through the historic vistas frozen in stone, serene and quiet temples, along with wildlife tour and beautiful beaches, and all this wrapped in luxuriant living, plush accommodations and sumptuous cuisine � you may be asking for too much. But there is one train that fulfills all these fantasies � the Golden Chariot. 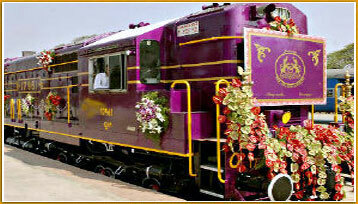 Golden Chariot train is a sojourn through Karnataka's choicest tourist destinations and Goa's most beautiful beaches. The 7-day journey takes you into the historic treasure troves of Hampi, Halebidu and Belur, Mysore's majestic Palaces and exotic gardens, temples frozen in history and exquisite wildlife at Nagarhole, Kabini. The experience never ceases to enchant you as it culminates the fun-filled week at Goan beaches. Board the Golden Chariot and have an experience of a lifetime. The itinerary of train includes Bangalore, Mysore, Kabini, Belur, Hampi, Badami, Pattadkal, Aihole and Goa. Hospitality on board is undertaken by country's one of the most famous Group, the Mapple Group. The 19-coach train has been well decorated with plush furnishings reminiscent of Hoysala style of architecture. The interiors are beautifully done along with all the modern-day amenities available on board including high-speed Internet and wi-fi. Stay connected with the world while journeying into the past by the time machine called the Golden Chariot. Be ready to titillate your taste buds in two restaurants on board, namely, Ruchi and Nala. Ruchi in Sanskrit means fine taste, while Nala was a legendary cook in the times of Mahabharata. Apart from these, there is a well-stocked bar Madira to give a complete heady experience. On board, there are a plethora of facilities available so that you never feel disconnected from your business or daily routine. A conference coach which can accommodate as many as 30 people with state-of-the-art equipments is on offer to cater to the needs of corporate guests to hold business meetings. For health buffs, there is a well-equipped gymnasium, spa and Ayurveda center. Embark on the Golden Chariot and experience a whole new world opened up on board. It is a sojourn where history talks. The Golden Chariot completely transports its guests into the portals of the yesteryears. Come on board the Golden Chariot Train and be a part of the saga retold.